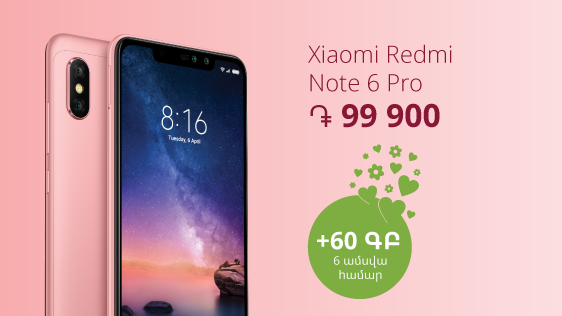 From March 1 till April 7, 2019 the spring offer named “Get Her a Smartphone with Love Inside” will be ongoing in Ucom. Within the frames of the offer, when acquiring Xiaomi Redmi Note 6 Pro or Samsung Galaxy J6 + smartphones from Ucom sales and service centers at special prices, both by cash or on credit, the new and existing subscribers of Ucom Prepaid service and Universal or Universal Plus tariff plans will receive 60 GB of mobile internet to be consumed during 6 months. “All those, who have decided to give a nice surprise to their loved ones, will present not just a smartphone, but a huge amount of mobile internet. I’m sure that your loved ones will appreciate the opportunity to stay in touch”, said Hayk Yesayan, the Co-Founder and Director General at Ucom. Let us add, that Xiaomi Redmi Note 6 Pro smartphone can be purchased at the price of 99.900 drams, while Samsung Galaxy J6 + is available at 88.800 drams. In case of acquiring of all the other smartphones, the new and existing subscribers of Ucom Prepaid service and Universal or Universal Plus tariff plans will receive 20 GB of mobile internet to be consumed during 6 months.